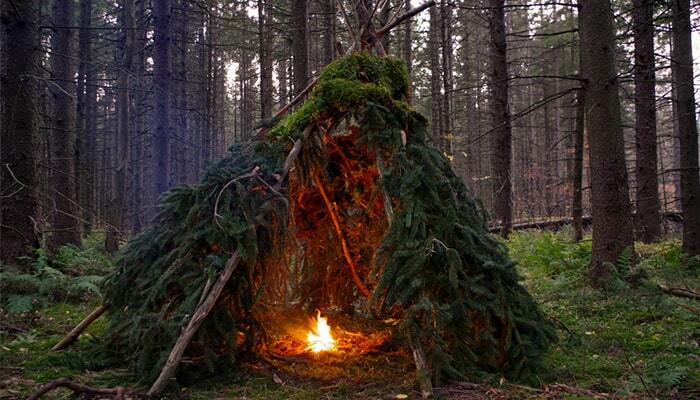 There’s nothing like spending the night in the great outdoors. It gives you a deeper appreciation for nature. It enables you to spend quality time with your loved ones. It even tests your survival skills. But camping can be intimidating or uncomfortable if you aren’t sure what you’re doing. Everything from finding a good campsite, to pitching a tent, to cooking dinner throws you out of your comfort zone! So if you’ve always loved the idea of sleeping under the stars, but always ending up booking a hotel instead 😉 this is the guide for you! A gleaming red sunset. The rushing water of a mountain stream. Snow in the trees as the evening light falls over the forest. These tiny moments are what make backpacking worthwhile. And yet so many people never venture out into the wilderness beyond sight of their cars. Are you interested in leaving civilization behind and immersing yourself in wilderness? Or in simply spending a relaxing weekend reading by your tent, looking out over a tranquil lake? 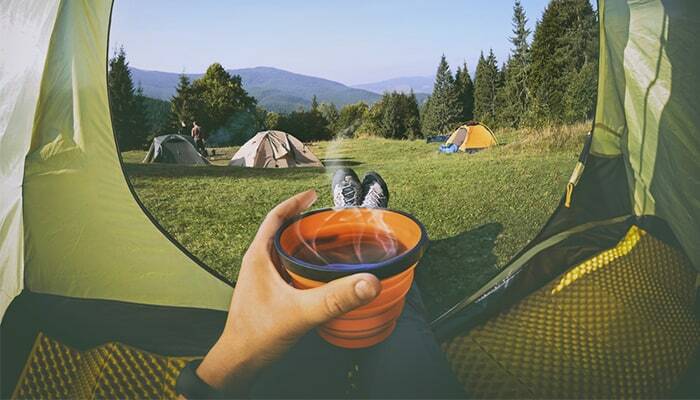 Camping is a wonderful way to take a break from the hectic pace of modern life. Leave school, work, and other obligations behind. Rally your friends and head to a campsite for some old-fashioned smores and ghost stories. 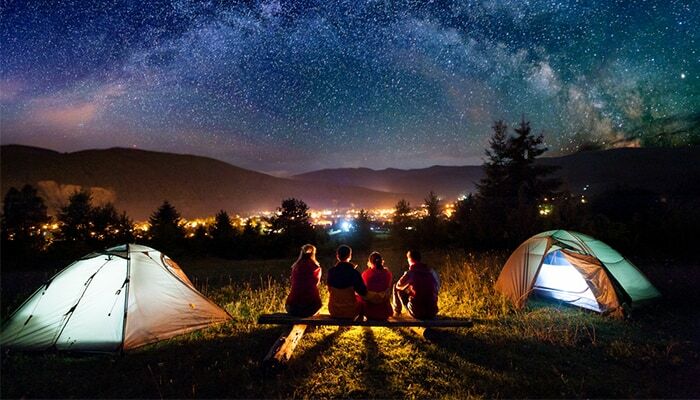 Invite a loved one to pitch a tent under the stars in the middle of nowhere. Challenge your endurance on a weeklong expedition through a treacherous mountain pass, camping solo every night. The easiest way to learn about the outdoors is to have someone show you. If that’s not an option for you, don’t worry—you can still learn everything you need to know with a little research and practice. Stay at a well-maintained campground, and do your research in advance to see what amenities are available. 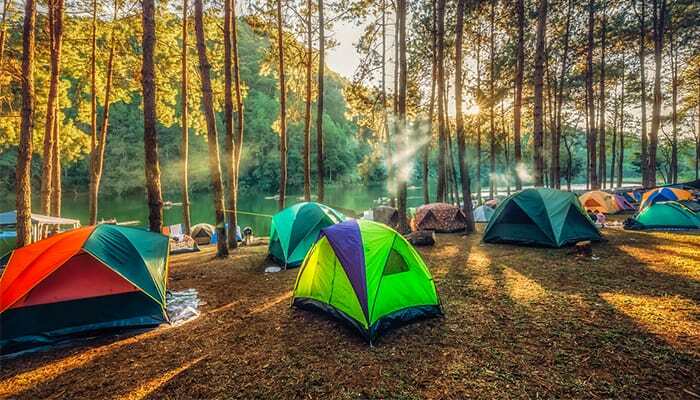 Ideally, arrive during daylight hours; setting up your campsite is easier when it’s light out, and there may be rangers or camp staff around to help you if any questions arise. Read the instructions at home, or search YouTube for a tutorial specific to your tent model. Then practice pitching it in your backyard or living room. Different tents have different designs and can be confusing until you have some practice. But imagine you arrive at your campsite a little late, in the dark, and it’s pouring rain. 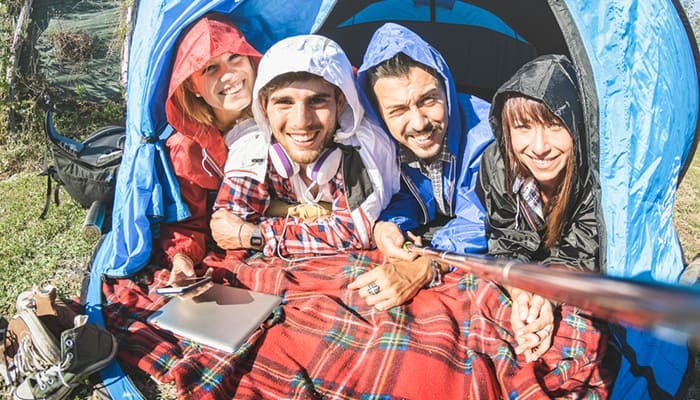 You’ll be glad to get your tent up quickly! Likewise, get to know you camping stove in your backyard or local park before cooking with it in the wilderness. There are countless gadgets that can make your life easier in the outdoors, but first get a sense of what camping is like before you spend a ton of money. In the sections below, I’ve listed some items that are either necessary or highly recommended. Get what you need, and gradually stock up on extras later. Opting for the cheapest gear possible is a recipe for a tent that leaks or a backpack that ruins your back. Do your research, read reviews, and talk to the staff at a local outdoors store like REI. If you’re on a super tight budget, try to track down items secondhand or on clearance. Many people no longer live near wild areas. As the world becomes increasingly urbanized, most of us end up living in or around cities. Access to the backcountry can seem impossible while sitting in an apartment, but it’s really not all that hard. You don’t have to buy a thousand-dollar plane ticket either. Start with a quick Google search. Look up local, state, and national parks in your area. Even in the depths of Manhattan, open forest is not all that far away. Honestly, the hardest places to find wild lands may be some of the plains states, where open farmland stretches on forever. But even Kansas has parks, so visit these. It’s not the Rockies, but outside is outside. If you’re a bit more ambitious, try making a long weekend trip to a nearby National Park. Most places should have one within a few hours on the road. Washington D.C. has the Shenandoah, Southern California has Death Valley, New Englanders can head up to Acadia. These places are really not that inaccessible, especially if you are able to take the trip over a holiday weekend. You don’t have to go deep into the backcountry either if that’s not your thing. Simply car camp at the park entrance and take day hikes around the area. You’ll still see tons of nature, and you won’t be limited by weight because all of your heavy gear will stay with your vehicle. While car camping is not my preference (I have actually come to enjoy sleeping in the dirt), it is a great way to get used to sleeping outside. Many parks now have wheelchair accessible areas, including accessible nature trails and campgrounds. With a little research, you can find a campsite and park that suit your needs. Car camping means that you drive to a designated campsite and pitch your tent near your car. The main benefit is convenience. 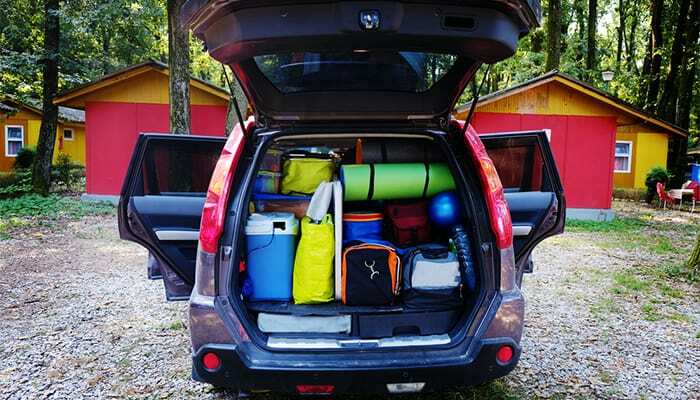 Since you’ll use your car for storage, you can bring in all sorts of heavy gear, camp chairs, extra food, and more. In contrast, when you’re camping in the backcountry, you have to carry everything in on your back, so you’re much more limited by weight. Almost every park or other outdoors area will have designated car camping areas beside the main road system. So scout these out online first. A lot of them will require a reservation, though they are mostly free or inexpensive in the United States. If you’re car camping only, try to find a spot away from major traffic, as nothing will ruin the ambiance of nature worse than the noise of a nearby highway. Before you go to a certain spot, look it up online and see what people have said about it. If everyone reports lots of noise and trash, you may want to look elsewhere. Also, look up rules and regulations of the area, as some will ban certain types of stoves, while others will have certain food storage requirements. Some places may require you to check in during a particular window of time. Do your research in advance to avoid any nasty surprises. Here’s an example: the information page on the Teklanika River Campground in Denali National Park. You’ll find reservation information, campsite rules and regulations, available amenities, and so on. You’ll learn that there is no cell phone reception or internet out here, nor is there a camp store (no ice or firewood for sale). Having this knowledge is essential for planning your trip. So you’ve decided on your trip and now you’re at the campground. There are a few features you want to look for as you choose and set up a campsite. First, find the water pump or well. Are you reasonably close to the water source? Unless you’ve packed huge amounts of bottled water, you’ll want to be reasonably close to the camp water source. Next, consider where to pitch your tent. 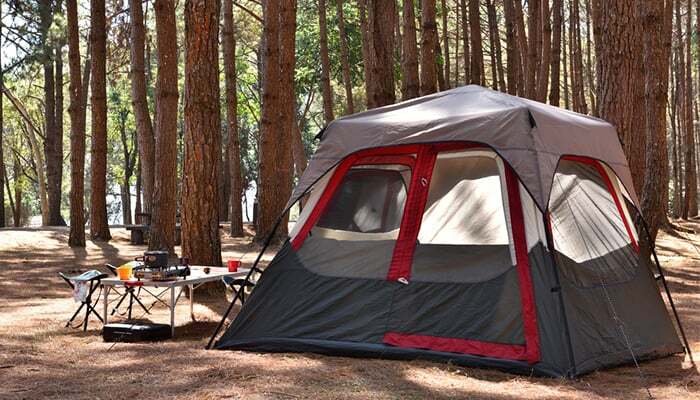 Since you’re at a designated campground, there will be fairly obvious areas in which to stake out tents. In general, you want an area that is relatively flat and not too hard. That’s about it for basic set-up! I’ll get to cooking in your campsite in a section below. Backcountry camping is quite a bit more complicated than car camping. Here are the basic steps of planning a backcountry camping trip. I’ll go into further detail on each category (gear, cooking, navigation, safety) in additional sections below. First, you’ll probably need to acquire a backcountry permit, which allows you to pitch your tent out in the wilderness, away from designated campgrounds. The permit system often helps space campers out too, so you’ll be sure of having a nice expanse of wilderness all to yourself. Look up permit requirements in advance. Take a look at the park map: what kind of terrain does your route cover? How much elevation change? Any potentially tricky river crossings? Choose a trail that meets your skill level. You’re not going out there to prove anything, so make sure you know your route and you know yourself before you even leave your house. Decide on a rough itinerary: how many days will you be camping? Roughly where do you plan to camp each night (and how much distance will you travel between campsites)? It’s a good idea to share this itinerary with someone back home. Wilderness areas can be huge. If anything goes wrong, you want the search party to know where to look. Next, pack the right gear. I’ll discuss this in more detail in the next section. In my experience, people often over pack for a given trip. Remember that when you go backcountry, all your gear goes with you in your backpack. Extra pounds add up to pain and fatigue fast. You probably don’t need three pairs of shoes or even a different outfit for every day. On the other hand, don’t skimp on necessities. Things like a raincoat, insulating layer, and some extra snacks may come in useful. Once you’re out in the backcountry, how should you choose where to camp? First, consider access to water. A great campsite is not actually great if it is a full mile away from the nearest water source. You’ll need water for cooking and staying hydrated out there. Find a stream or lake nearby—ideally, scout it on the map first before you even start hiking. Next, where to sleep? You want somewhere flat, and hopefully not hard as a rock either. When in the back country, you should also take care to limit environmental damage. If you’re near a major trail, I can almost guarantee that there will be previously used campsites, so to avoid harming local vegetation, use one of these. Be careful not to set up on the trail itself; game trails often function as animal highways, and there’s not much worse than waking up with an animal crashing through camp. Similarly, avoid camping in places where a nearby river is likely to flood if it rains. And make sure to pack out everything you pack in. What about your camp kitchen? If you’re in an area with predators, you should cook around 200 feet or more from your tent. You don’t want any traces of food near your sleeping space. You should also make sure to store your food securely every night, 200+ feet away from your tent and from your camp kitchen. You can use a container like a bear box to keep food safe and avoid attracting attention from bears. Once you’ve set up camp, it’s time to relax and soak everything in. Even on the hardest treks through the wilderness, stop to appreciate the things around you. Enjoy your time out there! Your packing list will depend a lot on whether you’re planning to car camp at an established campground or go backcountry. That said, here are some general guidelines that will help you pack! Dry-fit shirts made of synthetic material are great for hiking and spending time outdoors since they wick sweat away from your skin instead of trapping it. If you’re expecting cooler weather, bring a merino wool shirt or two to keep warm. You’ll also need some sort of hiking pants or leggings. In general, I prefer the flexibility of leggings, but when I know I’ll be bushwhacking or glissading (sliding down a hill on the snow), I bring thicker, waterproof hiking pants. If the forecast predicts very cold weather, consider packing some long underwear too! Socks are extremely important, especially if you plan to go hiking while you’re in the wilderness. Buy some wool socks, which will do a much better job at staying dry than cotton. Proper wool socks are the best defense against blisters. You can often make do, even on a longer camping trip, with only a couple shirts and pairs of pants. In fact, if you’re going backcountry, I’d recommend bringing the bare minimum clothing-wise. Two shirts, maybe one pair of pants. One item you probably don’t want to skimp that much on, however, is underwear. If I’m going camping for a week or less, I typically bring a pair for every day. And don’t forget a good sports bra or two ladies. Next up, you’ll likely want some sort of jacket, coat, or raincoat. Check the forecast beforehand. If you’re car camping, there’s no harm in bringing every coat you own, one for any occasion. If you’re going backcountry, however, try to pick one coat that suits all your needs. I have a 3-in-1 L.L. Bean coat, for example, that comprises a lightweight inner down layer and a waterproof shell. This coat can be worn as one, or unzipped into two separate layers. It’s become my go-to versatile camping coat. Finally, there are some accessories that you may want to bring for added comfort in the field. Sunglasses protect your eyes and are especially important if you’ll be in bright, snowy areas. Gloves come in handy in cold weather, or if you’re crawling over boulders. 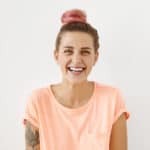 A hiking Buff is a circular strip of fabric that can be used for multiple purposes: keeping your ears and head warm, shielding your neck from the sun, serving as a sweatband, keeping hair out of you face, and more. Your choice of footwear depends on how active you plan to be. Will you be trekking deep into the backcountry? Bring hiking boots. Will you be car camping and using the campground as a base for numerous day hikes? Bring hiking boots. Will you be car camping and relaxing by the fire all weekend? Bring whatever shoes you want! 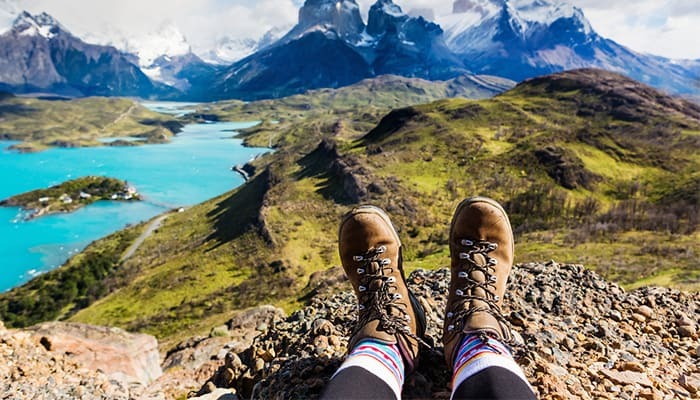 Assuming that you’ll be hiking, you probably want a decent pair of hiking boots. Visit your local REI or outdoors store and try a few pairs on if you don’t already have some. I’ve had good experiences with Asolo and Vasque, but there are plenty of high-quality boots out there. Around camp, footwear changes a bit. I definitely do not recommend sitting around camp in your boots, as those will cause your feet to sweat and smell over time. Instead, bring some lightweight, comfortable camp shoes. Some people like crocs. They might have a reputation for being hideous and awkward, but they are light, comfortable, and easy to port around. Hiking sandals (by brands such as Keen) also make great camp shoes. They’ll let your feet air out at night and also come in handy for river crossings. In cold or snowy weather, you might not want to walk around with exposed feet; in these cases, tennis shoes or moccasins work well. When I’m car camping, I like to bring my Teva knee-high boots; they’re water resistant and keep my feet warm and dry (though they’d be too bulky for a backcountry trip). Some final advice for anyone traveling backcountry: Go minimalist. You do not need four pairs of shoes out there. Try one for hiking and one for camp, done. And do you really need five shirts and three pairs of pants for a weekend trip? I once spent a full month in the field with a grand total of two shirts. Yup, they smelled a bit when I was done, but my back thanked me for the reduced weight. Less is more. For my month long trip, I packed five pairs of socks, but could have done with four. Same with underwear. So cut your gear down to a minimum. If you plan to hike out to your campsite, you will need a good backpack to contain all your gear: food, tent, clothes, and other items. Go for quality here with a reputable brand like Osprey. A good pack will save your back and shoulders by distributing the weight through its hip belt and suspension system. Most modern, well-constructed packs are also very lightweight, so the pack itself doesn’t add much to your overall burden. You can try on various packs and get advice at an outdoors store. You should expect to pay around $200 to $300, which is a lot, but this is one area that is worth the cost. Trekking poles, again, are useful if you’re planning to do any serious hiking. They take some weight off your knees when you’re going down steep inclines, and they can also be used to test out footing (is that loose rock in the middle of the stream stable?). Staying hydrated is essential to enjoying your trip. Many campgrounds have pumps with potable water; check before you go. Out in the backcountry, you’ll need a reliable method for decontaminating stream water. Don’t forget the toiletries! No one wants to be stuck in the middle of nowhere for a week with no toothpaste. Whether you’re car camping or backcountry camping, you’ll need the basics: toothpaste, toothbrush, dental floss, cleansing wipes, and Chapstick. Check in advance to see if your campground has showers; some don’t, and in those cases, I don’t usually bother bringing shampoo. Sunscreen and insect repellant are also essential items. A headlamp often proves invaluable, especially out in the backcountry. Many headlamps even come with a red light setting which enables you to see without ruining your natural night vision. I tend to keep my headlamp close by in my tent so I can find it easily at night. It’s also a nice thing to have if you like unwinding with a book before sleep! Finally, there are a few things that will lower your safety risks while out in the field. Bring a first aid kit in case of injuries. This kit should contain wraps and bandages, antibacterial ointment, ibuprofen (or Tylenol or Advil), hand sanitizer, Moleskine, and other basic items. A satellite phone is a good idea if you’ll be out of phone range, especially if you’re traveling alone or planning to be in remote areas for a long time. Bear spray is a useful defensive weapon if you’re camping in a bear habitat. More on safety below! Your comfort while camping depends heavily on your sleep set-up. I like small, light pop up tents. You can get a pretty affordable tent from a place like REI, especially when on sale. So keep your eyes open, and you should be able to get a solid tent for less than $200. Inside your tent, you’ll probably want some sort of foam pad, which will keep you warmer and more comfortable. You can also use an inflatable mattress, but there’s a risk of leaks. Get a sleeping bag that’s rated for the temperatures you’ll be sleeping in. Finally, a good camping pillow will help you sleep much more comfortably. If you’re in the backcountry, try an inflatable one to save weight and space, or wad up some of your clothes. If you’re car camping, you can go with as luxurious a pillow as you want! 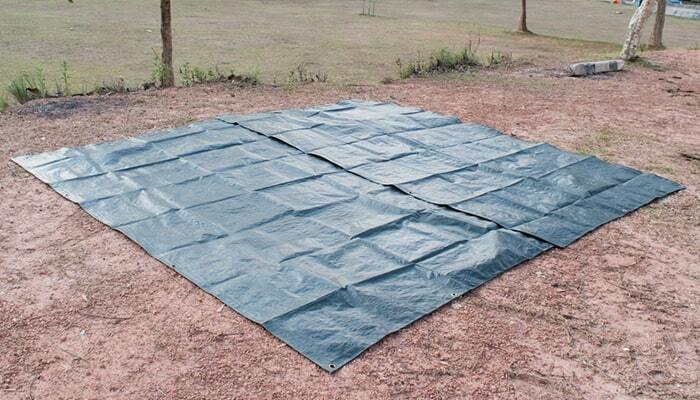 For further cost and weight savings, consider a tarp set-up. 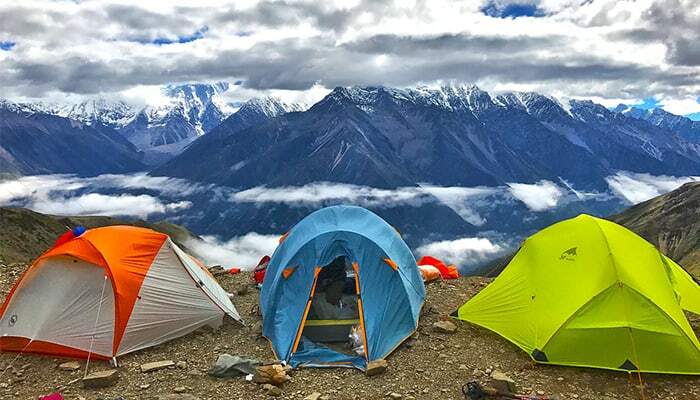 Though not as comfortable as a tent, a tarp, either of a rip-stop material (like a lawn tarp) or sil-nylon (the same as the outer wall of most tents) is still a solid shelter. I’d advise only trying out a tarp set-up once you’re a little more experienced though. For car camping, you can even add a large awning over your tent and camp area, though do be sure to tie it down securely in case of wind. Especially in rainy weather, it’s amazing to have a large dry space for cooking and hanging out. Keep in mind that bugs tend to cluster around shelters, especially those without bug nets, so bring bug repellant or even a head net. 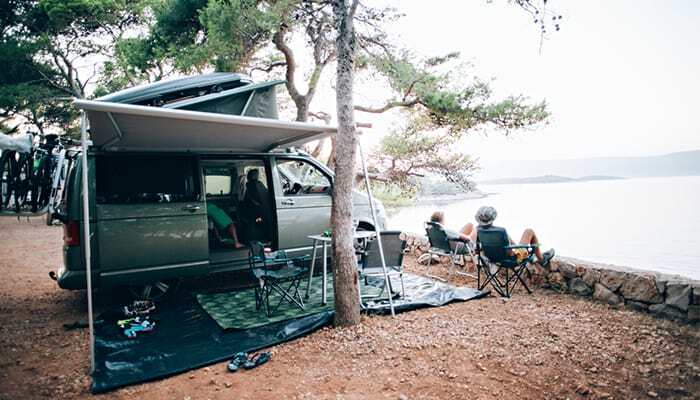 There are plenty of other things you can buy to make your campsite as cozy and comfortable as possible, but these basics should be enough to get you started. Now what about food and cooking items? Continue to the next section to learn about preparing food at your campsite. Hiking is hungry work, so how will you eat in the backcountry? Well, as a rule, people imagine that wilderness cuisine is…not great. But this doesn’t have to be true. Use a light, portable stove like a Jetboil or Whisperlite and you can prepare virtually any meal that you can on a stove top. One of my favorite dishes is quinoa with onions and, if I’ve been fishing, fresh trout. If you’re car camping, then something like a Coleman propane stove becomes a great option. These things are essentially a fully portable stove top just like you have at home. Obviously, you don’t want to carry one of these guys in the back country, but if you’re living out of a car, it’s a great choice. Unlike a lot of other hiking stoves, a propane stove gives you full adjustability in terms of heat output. Also, they’re not all that expensive, and neither is their fuel. You can also bring just about any food you like since you can use your car as storage space. Remember, however, that you will probably not have access to a refrigerator, so only bring foods that keep for a while. If you’re just coming in for a night or two, you might be able to use a cooler to store some precooked meals. Otherwise, there are plenty of options: pasta, quinoa, rice, potatoes, cured meats, apples, bananas, onions, oatmeal, pancake mix, chocolate, nuts, olive oil, the list goes on. Bring a portable stove, basic utensils, and some cookware, and you’re good to go! If you’re backcountry camping, you need to be much more concerned with weight and portability. You still have quite a few options for food. Some people go with pre-cooked foods, like military MREs or freeze-dried astronaut food. I cannot in good faith recommend MREs to anyone, though they are much better than they used to be. Freeze-dried foods are very light and easy to cook (just add hot water), but they are quite expensive. Personally, I prefer to cook on my own meals: rice, quinoa, that kind of stuff. A simple mixed dish of rice, onion, spices is easy to prepare and very affordable. You can get pretty fancy out in the field too; a friend of mine made calzones out in Wyoming. That’s a bit beyond me, but oatmeal, fried rice, or spicy quinoa is very simple. I like to bring a few spices like paprika into the backcountry with me. They add virtually no weight to my pack and lead to much tastier food. Just don’t believe the people who insist that back country cuisine has to either be expensive or nasty. Cooking in a camp setting is different, but with a little practice you can get it down. What kind of stove to cook with? Again, you have multiple good options. The most common option is something like a Jetboil, a stove operating off of a pressurized canister of fuel. These stoves run between $30 and $150 and generate a lot of heat. They boil water very fast, though cooking on one can be tricky, as they have a tendency to burn food to the pan. There are also wood burning stoves. I have an Emberlit stove and I really do like it. As far as lightweight and affordable goes, wood stoves win. My stove weighs seven ounces. Plus the fuel is free and does not have to be carried with me. Also, since it is a plain old fire, heat is easily controlled by feeding more or less wood. Finally, there are white gas, or naptha, stoves. The best of these is the MSR Whisperlite, which is a bit heavy, but makes up for that in versatility. The whisperlite can burn fuels from white gas to car fuel with the right attachment. These stoves are the preferred methods of cooking for outdoors schools like NOLS. They boil water fast, have adjustable heat output, and are fairly easy to use. Like with everything else, try to borrow from a friend before buying, and even then, try to buy used before you buy new. All three of these stove types will cook fine, though canister fuel stoves struggle with simmering or sautéing. So if you want light and affordable, try a wood stove. If you want simple, try canister fuel stoves. If you want maximum cooking power and versatility, try a Whisperlite. You’ll also need some basic pots and pans and a lighter, as well as cooking utensils and dishes. You can find these items at your local outdoors store. You might be tempted to pack what you already have in your kitchen, but this is a bad idea for backcountry camping. 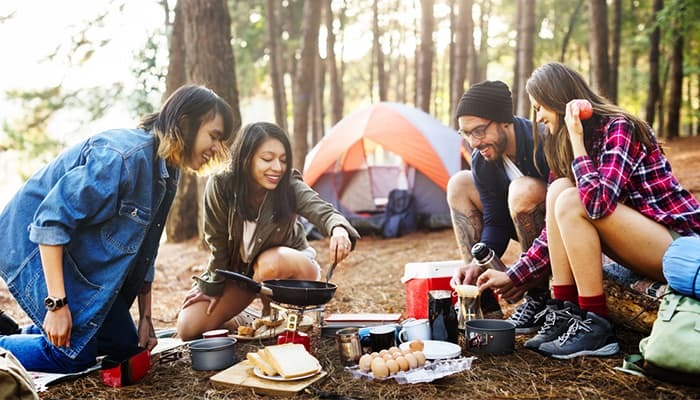 A pot, pan, plate, or set of utensils built specifically for camping will be much lighter and will often collapse down somewhat to save space. One vital aspect of camping that a lot of people forget about is water. Carry some method of purifying water, since diseases like giardia and cryptosporidium are vicious and will certainly make you regret drinking dirty water. Just because water looks clear does not make it safe. I like the AquaMira drops, as they are cheap and light. Water filters also work, though they are very heavy in comparison. Boiling water is as effective today as it was a thousand years ago, but honestly, it takes a lot of time and effort. If you’re staying at a campground, there might be a pump with potable water, or you can stock up on water bottles in your car. But whatever you decide to do, make sure you drink only clean water. Now for something that frightens a lot of people. Navigation. How do I not get lost out there? First, carry a paper map. Your phone GPS is not an adequate navigational tool. Most any park entrance will have a paper map either for free or for a nominal fee. I won’t be going deep into the details of backcountry navigation here, but as a general rule, take your time. I’ve seen people get lost because they rushed their way through the land and lost track of where they were. When in doubt of your location, stop, look at your map, and see if things around you match what’s on your paper. And never be ashamed to ask for help! Try to stay on well-established trails and periodically take a moment to check your map. A helpful tip for map reading is to orient the map to the terrain. This means that if you’re looking south, orient your map so it is facing with its north end facing north and its south end facing south. Try to match features on the land to features on the map, though be careful not to force association. Don’t assume that a river in front of you is a certain river on the map without looking at other features too. Notice the steepness of the land, as shown by contour lines on the map. By careful map reading, you can stay found even in the deepest wilderness. If you’re just out car camping and don’t intend to stray all that far into the wilderness, ask a park ranger or some park employee, typically found at the park entrance, where they recommend for you to stay. Park workers will know a lot more than a simple map can ever tell you, so find out what they know and use that to plan your trip. Again, don’t depend too much on your GPS, as the smaller park roads may or may not be programmed on it. Whenever you’re headed backcountry, plan your route well in advance, and better yet, have alternates already in mind in case something goes wrong. Know how to read a map, especially how to translate contour lines from abstract art forms on a page into real life terrain. And do not rely on your GPS to guide you through the woods. Also, it’s a good idea to remember where you came from. Simply look behind you from time to time, so that if something goes wrong with your route, you can go back to your starting point. If you ever encounter something like an unsafe river crossing, it is far better to turn back than to risk yourself. 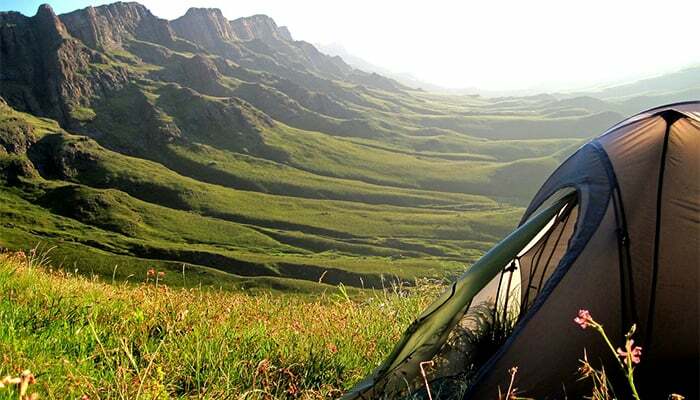 Most people enjoy their camping trips without encountering any particular risks. ut things can go wrong, and it’s a good idea to know what to do in case of accident or emergency. Furthermore, you should know how to take simple precautions to reduce your odds of encountering an aggressive bear or a dangerous river crossing. I’ve been close to bears but never felt threatened by one. 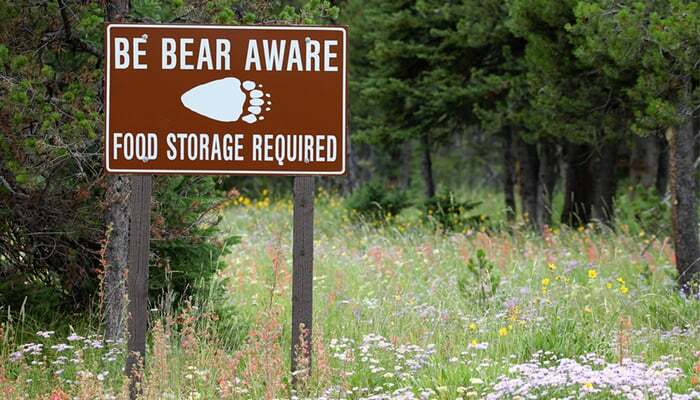 There is one universal rule about staying safe from wildlife: store your food in secure containers (bear cans or ursacks) and keep it far, far from where you choose to sleep. Keeping food in your tent is a great way to get a nasty wakeup call from an animal. But if you store food properly, and make noise as you move through denser terrain to scare animals off, you’ll be fine. And never, never feed the wildlife. Never. What if you do have a close encounter with a bear? Don’t run. Stand your ground, speak calmly, slowly raise and lower your arms. Sidestep slowly away and stop if the bear begins to follow. There’s a good chance, however, that the bear isn’t all that interested in messing with you. For further information on bear safety, check out the resources here and here, and watch this National Park Service video on how to use bear spray. Moose sometimes pose a threat to campers and hikers as well—often they’re more dangerous than bears since people are less afraid of them! But moose are large, and a cow moose will be especially dangerous if she perceives you as a threat to her calf. So keep your distance. Since moose are not predatory, you can run away if one charges at you. While hiking out to your campsite, you may come across rivers or streams. If the water is shallow and moving slowly, this should be no trouble; you may want to swap out your hiking boots for sandals before walking across though. Some river crossings are more difficult. Try to pick a wider section of the river. Narrower sections are often deeper and faster-moving. Then cross the river slowly while facing upstream. Stepping sideways is usually more stable. If you’re in a group, you can link arms or hold onto each other’s hips. Unbuckle your backpack’s hip belt and sternum strap before setting across. If you fall, you may need to ditch your pack to get back up. Finally, don’t hesitate to turn back and choose another route if you feel unsafe! This is when your first aid kit will come in handy! It’s not uncommon to get a few minor cuts and scrapes while you’re in the outdoors. Just wash them out, apply an antibacterial cream (like Neosporin), and cover with a bandage. As for injuries, you’re probably most at risk of a sprained ankle. If you’re at your campsite already, elevate the foot, let it rest, and take some painkillers if necessary. If you’re out on a trail when you twist your ankle, again, sit down and assess the situation. If the pain and swelling are severe, wrap the ankle in a roll from your first aid kit, let it rest a little, and then try to get back to camp. Ice or cold water will help reduce swelling if you have access to it. Taking some precautions on your camping or hiking trip will lower your odds of injury. For example, always warm up before engaging in strenuous physical activity. Pay attention to the terrain, especially if it is steep or slippery. Choose trails and activities that are suited to your fitness and experience level. You’re more likely to get injured when you’re tired or out of your comfort zone. A satellite phone like the DeLorme InReach will come in handy if you are alone and truly stuck out in the wilderness with a severe injury. At the very least, remember to tell a friend or family member your hiking and camping plans beforehand—where you’re going and when you plan to return. Take basic safety precautions in your camp kitchen to avoid setting any uncontrollable fires. When car camping, you should be able to use preexisting campfire sites, often bordered with rocks to contain the blaze. Make sure the area surrounding the fire (about a ten-foot diameter) is not flammable—there shouldn’t be any dry grasses, twigs, litter, or other flammable materials close to your fire. Do not leave your fire unattended, even for a minute or two, whether you’re using a camping stove or a larger open fire. Finally, make sure all fires are fully extinguished. In this article, I’ve gone over some of the more practical aspects of camping. Over my life, I have spent months, at this point nearly amounting to a full year in the field. I’ve learned my lessons, some by failing and making mistakes, others by listening to advice from others. Don’t let the fear of failure drive you away from the wilderness. Even at the point I’ve reached, going out on month long expeditions in the Wind River Wilderness, I still consider myself a rookie. Wild lands can teach you so much, from mundane technical skills like setting up a camp in horrendous weather to deeper messages about that matters in your life. And that is what keeps me going back. Hiking, camping, backpacking will never be entirely pleasant activities. Snow and rain still bother me, as do things like hunger or unexpectedly rough terrain. But I return every few months. I push myself deeper out into the field, into lands so few humans ever have the chance to see. My first view of the Milky Way was out in the wilderness, and that still stands in my mind as one of the defining moments of my life. I hope that you will also be able to find that type of feeling while out in the field. The point isn’t just escaping, or personal challenge, let alone something like mastery or conquest of the wilderness. Such things do not exist. They are paradoxes. Even if you live in the wilderness, you will never master it, never truly own it. However, simply by taking your time to experience our wild places you become a part of them. And they become a part of you. Thanks for checking out my guide! 🙂 As you can probably tell, I love camping! It’s the ultimate ‘getting back to nature’ escape. It keeps me close with my family and enables me to see the world in a way most people don’t. I can’t recommend it enough and hope that I’ve given you some practical advice for your first/next trip! 7 Best Camping Coolers That Are Brilliantly Bear-Proof! What is a Tent Footprint Used For? 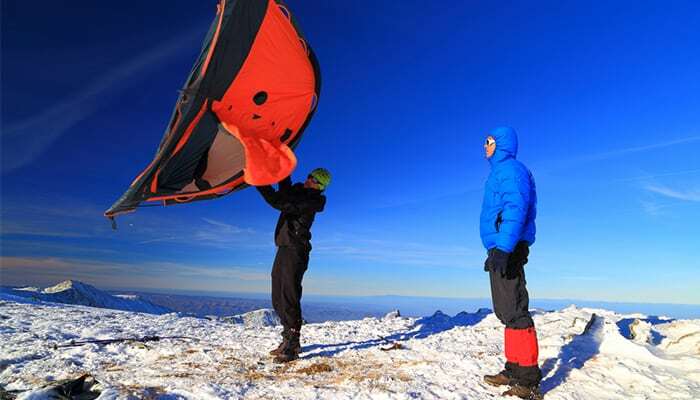 How to Pitch a Tent Quickly in Any Conditions!